Quarterly publication issued in Breslau from 1862 to 1873 (11 vols.) by Abraham Geiger. It was originally Geiger's intention to call it "Zeitschrift Biblischer und Jüdischer Wissenschaft," and he was partly led to issue the "Zeitschrift" because of Hilgenfeld's refusal to publish in his "Zeitschrift für Evangelische Theologie" articles written by others than Protestants (see Geiger's "Nachgelassene Schriften," v. 255 et seq.). 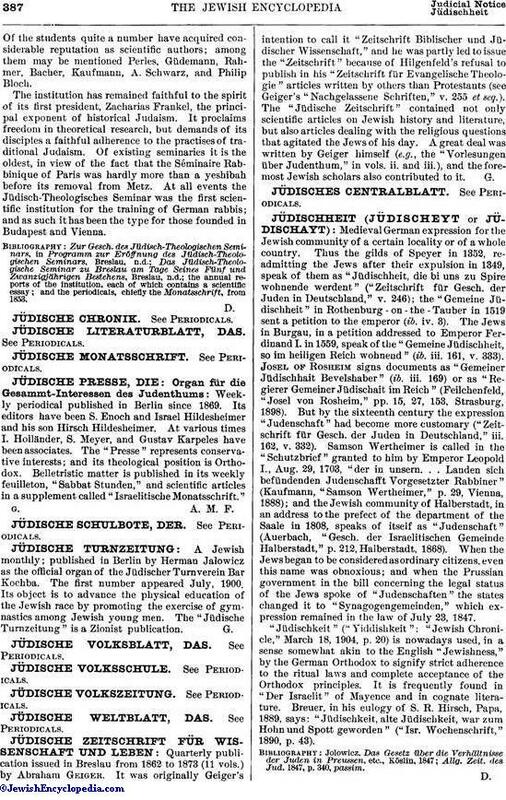 The "Jüdische Zeitschrift" contained not only scientific articles on Jewish history and literature, but also articles dealing with the religious questions that agitated the Jews of his day. A great deal was written by Geiger himself (e.g., the "Vorlesungen über Judenthum," in vols. ii. and iii. ), and the foremost Jewish scholars also contributed to it.